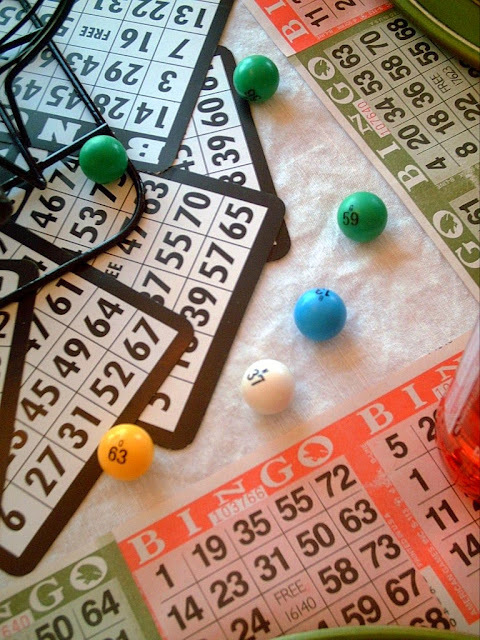 Are you ready for a fun night of Bingo? 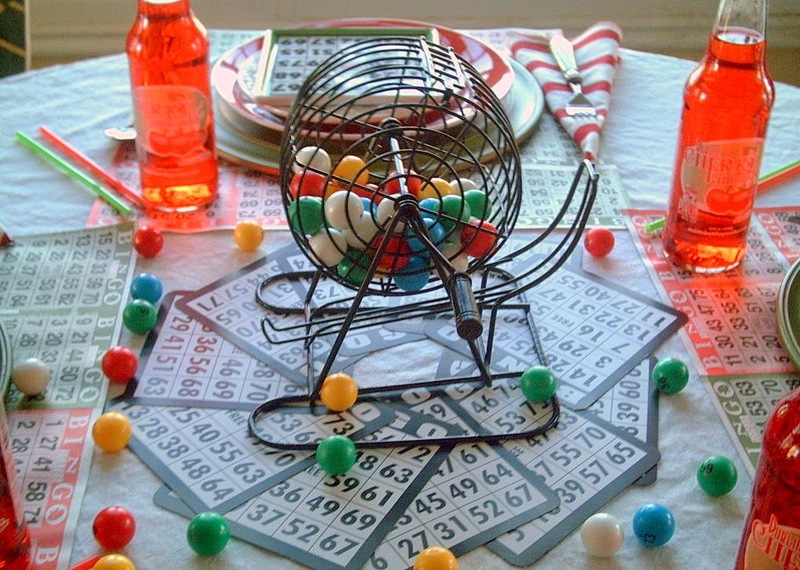 We play some kind of Holiday Bingo all the time. We have Halloween, New Year's, Christmas, even a 4th of July version. Eventually everyone wins a prize. From the oldest to youngest. Rarely do we play the actual Bingo game, like as on my adorable salad/dessert plates that I found. 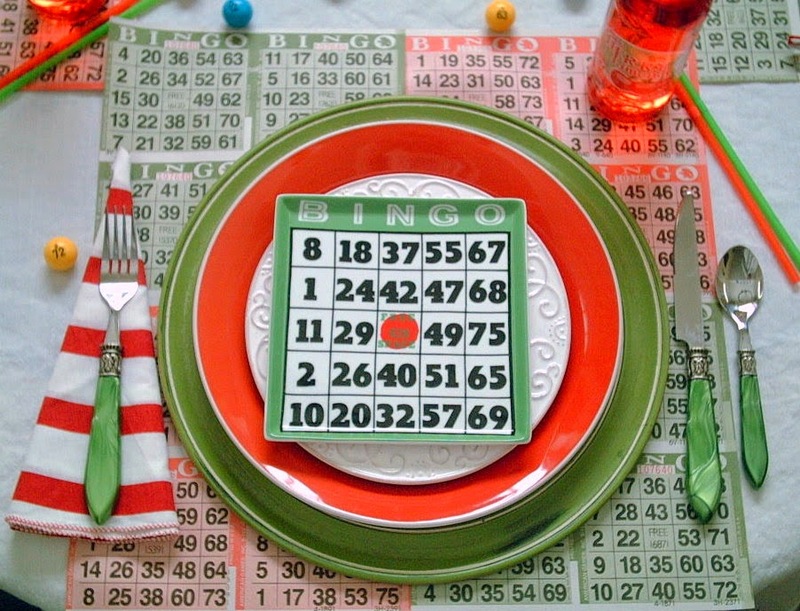 When I saw these cute porcelain Bingo plates I had to have them, or should I say, wanted to have them. 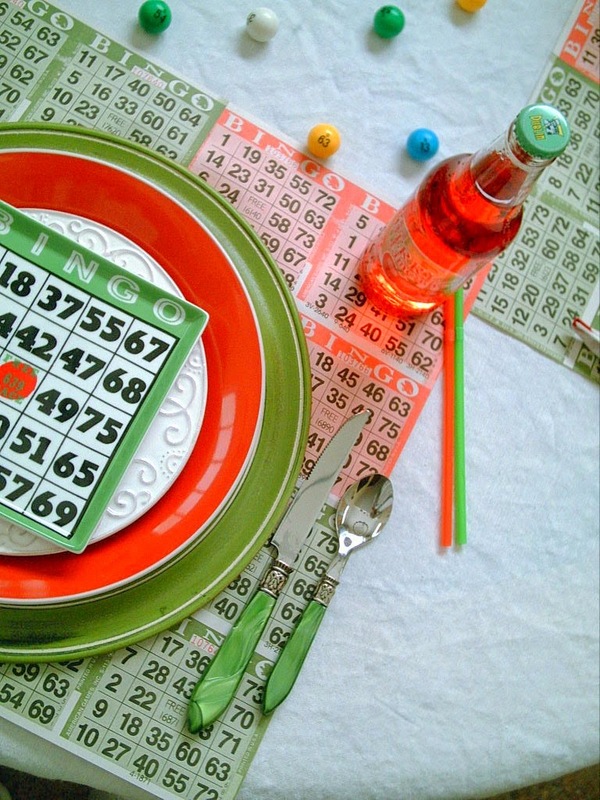 I found the Bingo plates at a small French themed boutique call Maison de Confiserie. Bingo plates are from Rosanna. The white plate under the Bingo is from Tai Pan Trading. 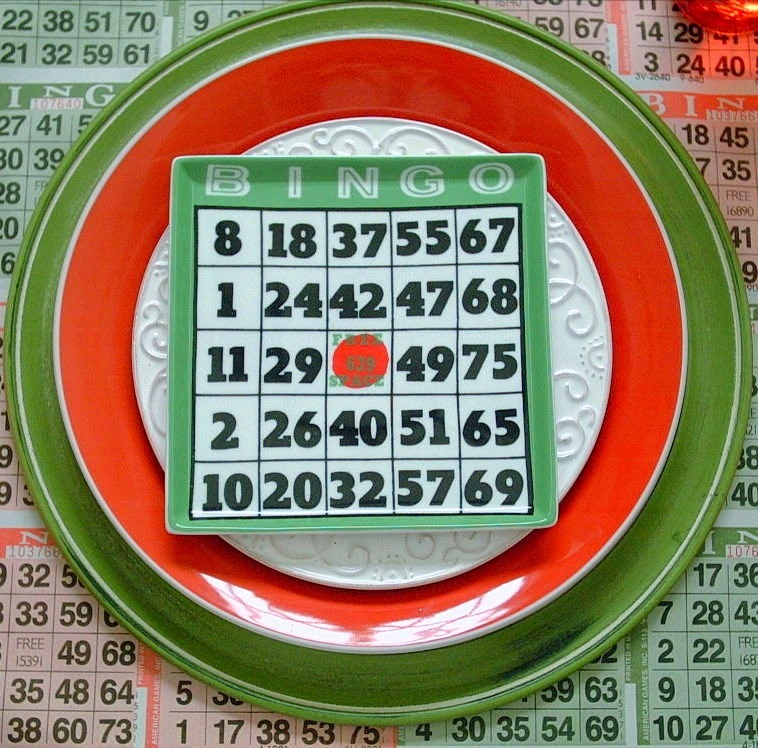 The Chinese red plate from Target and the green charger from Pier One. 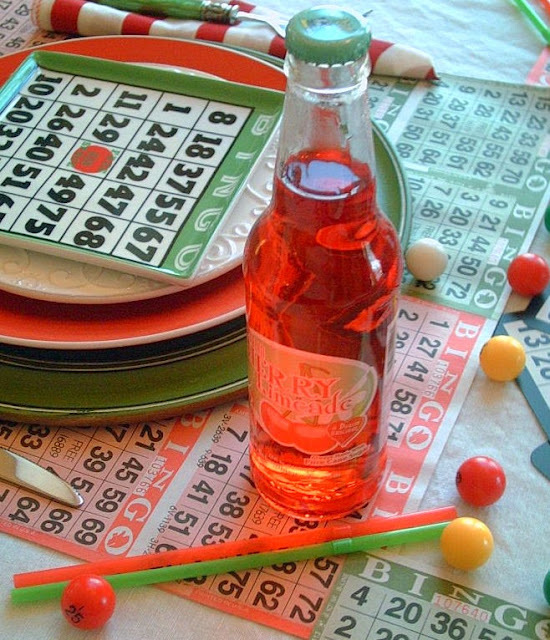 I took some actual Bingo cards to make placemats. I don't know if you noticed but all the plates have a white rim around the edge. I thought they coordinated well. 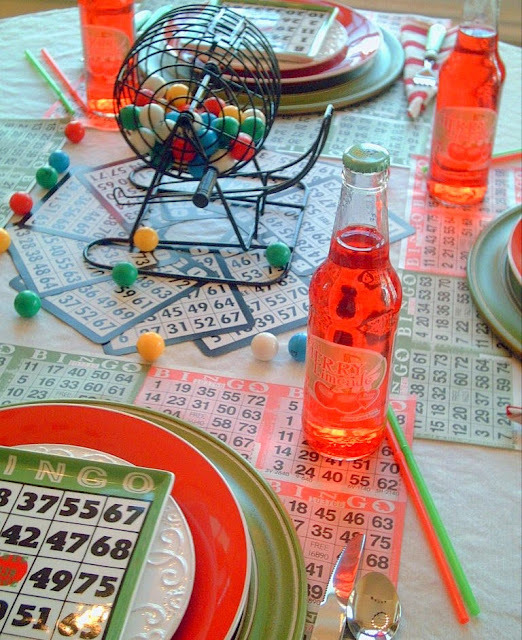 My centerpiece is a real Bingo game which we will actually be using. 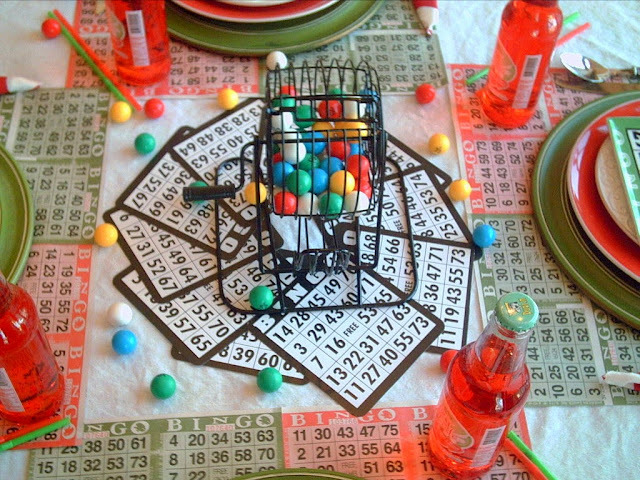 I scattered some Bingo balls around the table for a table scatter effect. 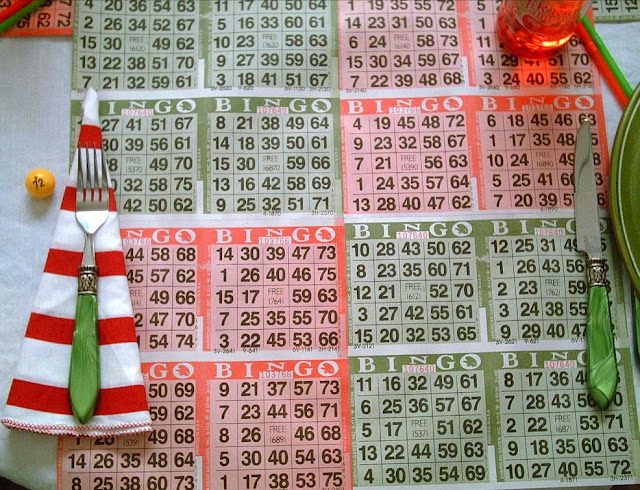 I made the placemats by joining some paper Bingo cards together. I used 4 sets. There were 4 cards on each sheet. I just taped them on the back. I am going to have them laminated so I can reuse them. There is a school supply nearby that laminates for a low cost. The drink for the night is some cherry limeade. 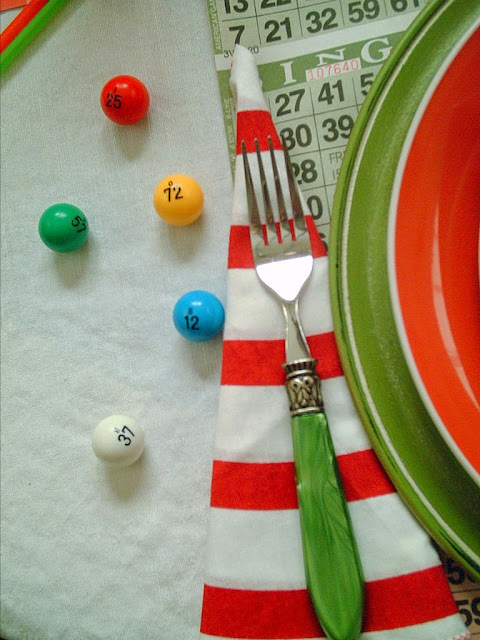 I thought the red and green looked perfect with the tablescape colors and it tastes wonderful. 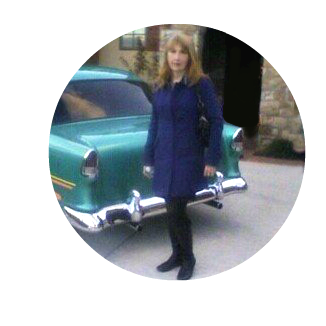 Thank you for taking the time to check out my latest blog. Please feel free to make a comment. They make my day!I'm participating in Tablescape Thursday at Between Naps On The Porch. Very cute and creative Valerie. 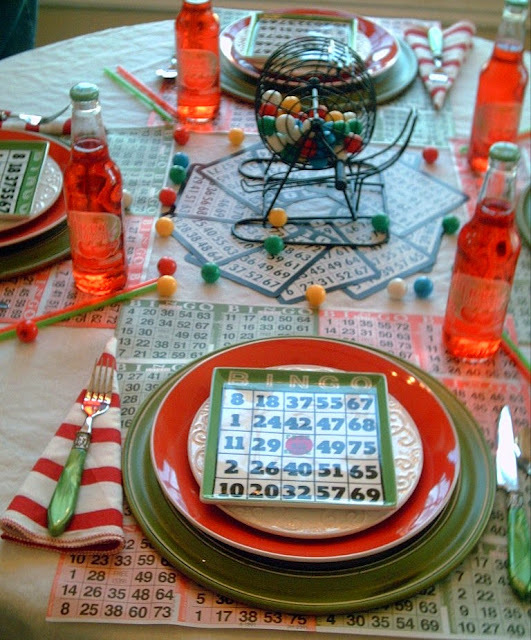 Love how you made the placemats. 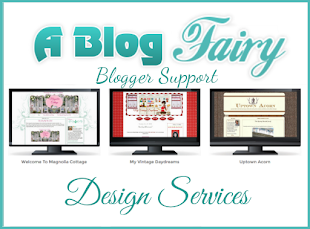 This theme is fun for the family. You always find the best plates....I wanted to point out you have two duplicate posts on your favorite things. One is below this post and has no photos. "We play some kind of Holiday Bingo all the time." Oh my gosh, so do we! And like you, it is almost always a themed bingo game. I'm going to have to track down those plates. Too cute Valerie! I just love all your fun details! Wonderful fun! Now I want to play Bingo! This is one of the best tables that I've seen in a long time. Oh yes, you HAD to have those Bingo plates. I would have too. They are, after all, quite unique, and look at the creativity they brought forth in you! What a fun place to have dinner.